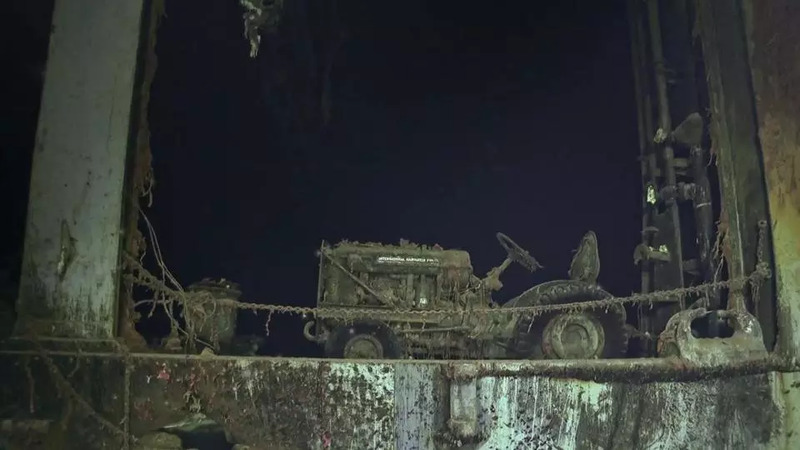 ALAMEDA, CA - The crew of the Research Vessel Petrel, sponsored by the Paul Allen Foundation, announced today that they have discovered the remains of the USS Hornet (CV-8), just east of the Solomon Islands, on the bottom of the Pacific, about three miles down. The discovery was featured this morning on the CBS This Morning. 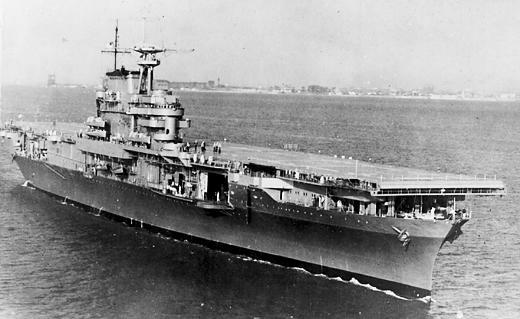 The USS Hornet (CV-8) was catapulted into the forefront of U.S. Navy history on April 18, 1942 when sixteen B-25 "Mitchell" aircraft were launched from the carrier's deck and led a daring attack by then Lt. Colonel Jimmy Doolittle. The attack was the first to strike the Japanese mainland and proved to be a huge morale booster for Allied forces. Following the Doolittle Raid, Hornet (CV-8) was key participant in the Battle of Midway on June 4-7, 1942, which many naval historians consider the turning point in the War in the Pacific. On October 26, 1942, during the Battle of the Santa Cruz Islands, Hornet (CV-8) received several direct hits from enemy aircraft, USS Hornet (CV-8) was mortally wounded and eventually sunk. As a tribute to and in honor of Hornet (CV-8), the USS Kearsage, her keel had been laid just eight weeks before on August 3, 1942, was renamed USS Hornet (CV-12) and commissioned on November 29, 1943. 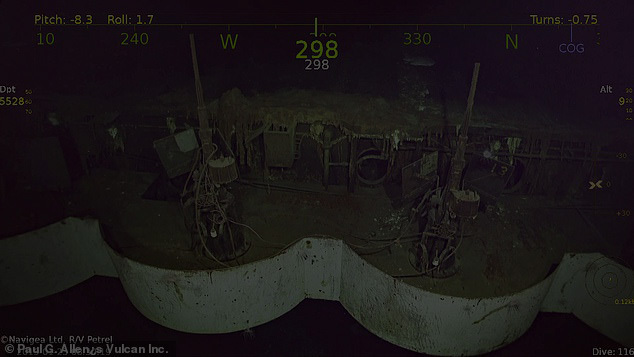 "It is wonderful to know that our predecessor, USS Hornet (CV-8), has been discovered after all of these years," said USS Hornet Sea, Air and Space Museum Executive Director Michael McCarron. "'Hornet' is one of the most decorated and hallowed names in U.S. naval history. We are humbled to share that name with CV-8 and honor and remember the brave men who served and made the ultimate sacrifice while serving in CV-8." The USS Hornet Sea, Air and Space Museum currently has exhibit about CV-8 on the Hangar Deck of the Museum. Visitors are encouraged to see firsthand the story of USS Hornet (CV-8) when they visit the Museum. HORNET (CV-8) received four battle stars for World War II service. heroism and distinguished service beyond the call of duty" in the Battle of Midway. The Seventh ship to bear the name. 25 September 1939 - Keel of USS HORNET laid down at Newport News, VA.
14 December 1940 - Launched by Mrs. Frank Knox, wife of the Secretary of the Navy. 02 February 1942 - HORNET left Norfolk with two B-25 Mitchell medium bombers as a feasinility test. HORNET'S crew was surprised when the bombers launched with out a problem. 04 March 1942 - Left Norfolk for Pacific Ocean, via the Panama Canal. 01 April 1942 - Sixteen USAAF B-25 Mitchell Bombers and 134 Army personnel loaded aboard HORNET at Alameda Naval Air Station. 18 April 1942 - HORNET and ENTERPRISE spotted by Japanese picket boats while still 650 miles east of Japan. LTC James Doolittle made the decision to immediately launch all bombers at 0830 hours in gale force winds (45kt) and 30 foot seas. Doolittle's raiders struck from Tokyo to Osaka incurring only superficial damage. But, the boost to American morale in the aftermath of Pearl Harbor was immeasurable. 73 of 80 pilots and crewmen survived the raid. They then headed back to Pearl Harbor for a turn around for the Battle of Coral Sea. 30 April 1942 - Left Pearl Harbor to aid LEXINGTON (CV-2) and YORKTOWN (CV-5) in the Battle of Coral Sea but arrives 1 day late, by the time HORNET reached her destination the battle was over. 26 May 1942 - Returned to Pearl Harbor with damaged YORKTOWN. 28 May 1942 - HORNET, ENTERPRISE and YORKTOWN depart Pearl Harbor for Midway Island in anticipation of an enemy attack. 04 June 1942 - Japanese carrier-based planes were reported headed for Midway in the early morning. HORNET, YORKTOWN, and ENTERPRISE launched strikes as the Japanese carriers struck their planes below to prepare for a second strike on Midway. HORNET dive bombers missed contact, but 15 planes comprising her Torpedo Squadron 8 found the enemy and pressed home their attacks. They were met by overwhelming fighter opposition about 8 miles from three enemy carriers and followed all the way in to be shot down one by one. Ens. George H. Gay, USNR, the only surviving pilot, reached the surface as his plane sunk. He hid under a rubber seat cushion to avoid strafing and witness the greatest carrier battle in history. 06 June 1942 - HORNET planes attacked the fleeing Japanese fleet to assist in sinking cruiser MIKUMA, damaged a destroyer, and left cruiser MOGAMI aflame and heavily damaged. Hits were also made on other ships. HORNET's attack on MOGAMI wrote the finis to one of the decisive battles of history that had far reaching and enduring results on the Pacific War. This great victory by HORNET and our other ships at Midway spelled the doom of Japan. 17 August 1942 - HORNET sailed to guard the sea approach to bitterly contested Guadalcanal in the Solomons. Bomb damage to ENTERPRISE (24 August), torpedo damage to SARATOGA (CV-3) (31 August), and loss of WASP (CV-7)(15 September ) reduced carriers in the South Pacific to one, HORNET. She bore the brunt of air cover in the Solomons until 24 October 1942. 24 October 1942 - HORNET joined ENTERPRISE and steamed east of the Santa Cruz Islands to intercept a Japanese strike force consisting of four carriers, four battleships, ten cruisers, thirty destroyers and twelve submarines positioning to reinforce positions on Guadalcanal. 26 October 1942 - The Battle of Santa Cruz Island took place without contact between surface ships of the opposing forces. That morning ENTERPRISE planes bombed carrier Zuiho. Planes from HORNET severely damaged carrier Shokaku, and cruiser Chikuma. Two other cruisers were also attacked by HORNET aircraft. Meanwhile, ENTERPRISE was hidden by a local rain squall, and HORNET, became the focal point of the Japanese coordinated dive bombing and torpedo plane attack which left her so severely damaged that she had to be abandoned. From 09:10 to 09:17 HORNET was hit by two Kamakazis, seven bombs and two torpedoes. After this the cruiser NORTHHAMPTON (CL-26) took HORNET under tow. Later in the early afternoon HORNET had fires under control and was making ready to get under way when she was attacked for the second time by six Kate torpedo planes. At 16:25 the order was given to abandon ship. Commented one sailor, awaiting rescue, when asked if he planned to re-enlist, "Dammit, yes-on the new HORNET!" Captain Mason, the last man on board, climbed over the side and survivors were soon picked up by destroyers. The abandoned HORNET, ablaze from stem to stern, refused to accept her intended fate from friends. She still floated after	receiving nine torpedoes and more than 400 rounds of 5-inch shellfire from destroyers MUSTIN and Anderson. Japanese destroyers hastened the inevitable by firing four 24-inch torpedoes at her blazing hull. 27 October 1942 - At 01:35, HORNET finally sank to her eternal grave in 16,000 feet of water off the Santa Cruz Islands, one year and six days after being commissioned. 13 January 1943. 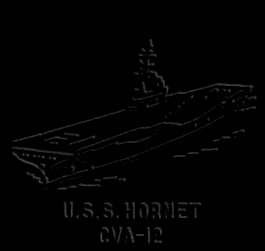 - HORNET'S proud name was struck from the Navy List.